Here’s an idea for how to get light-rail transit onto West Broadway while connecting the Northside with its river front. West Broadway is one of Minneapolis’ most important streets but it’s physically divided from downtown and the rest of the city. Highways and railroad tracks make travel between downtown and North Minneapolis unattractive. Additionally, North Minneapolis has very weak connections to its riverfront. The very railroad tracks that are contributing to this division could be the solution. The Railroad tracks that run along what would be North 1st Street between Plymouth and Broadway are an under-appreciated link between Downtown and the Northside. In combination with North 10th Street, this route merges the Green line with West Broadway, while activating the underdeveloped river front (see map). Metro Transit Headquarters is where the proposed route begins (see Image 1). After connecting with the Blue and Green lines, this proposed line curves around Heywood Garage to North 10th Street. On 10th, the trolley should make multiple stops to increase development on this far end of the North Loop. One block past Washington, across 2nd Street, the proposed tracks incline onto private property. Here, the tracks merge with Canadian Pacific rail lines. For the stretch between Plymouth Ave and West Broadway (see Image 2), the line would help generate a dense, diverse community. Not only would this be a place of industry, but home to residential and commercials spaces as well. Running a transit line nearer the river, instead of on Washington Ave., creates a place in itself, instead of simply a through-way. The increased density will create a demand for parks and the Above the Falls Plan. At Broadway, the tracks are elevated above the street. This is an important aspect. Both sets of tracks have to curve apart as West Broadway comes up to join them. This is good for biking down Broadway – the curving tracks don’t have to be crossed, hence less possibility of catching tires in tracks. The sidewalk might be elevated with the tracks rather than at the street level. Along West Broadway, the tracks should run on the side, between the sidewalks and bike lanes (see image 3). Essentially, the transit line takes the parking lane while the other lanes are narrowed and reallocated. Driving space will consist of a single, narrow lane for through traffic and turn lanes when necessary. There also must be a wide, dedicated bike lane in each direction. Ultimately, the sidewalks need to take highest priority. For a truly sustainable city, walking is key. There should be frequent, heated transit shelters and water fountains. The line should slowly curve up West Broadway, connecting Penn and terminating at Theo Wirth Pkwy. From Target Field to here is a mere 4 miles. This short route will stimulate development at the city’s core and Northside while connecting neighborhoods that have previously been divided. Suburban communities that wish to connect to the line can pay the City of Minneapolis. The images above show a red line on the route I’m referring to. The map indicates the location of each perspective view with a circle. You can click on the images for greater detail. This proposed alignment, as described, sounds like a good idea, but should be brought to local residents for consideration early on to determine if it would meet the needs of those who live and work between downtown and North Minneapolis. Also, I’m confused as to whether this is envisioned as light rail or a streetcar. The title refers to LRT, but then later in the article you talk about the “trolley”. Can you clarify? Also, would this replace the current Bottineau Line alignment or supplement it? This alignment is what Bottineau should have been in the first place, not a suburban commuter line through the park that bypasses one of the most transit-dependent areas of town. I love the drawings and I really hope you get someone in power to listen to you. This is a fantastic idea and representative of what transit *should* be in this city. I believe the tracks you are speaking of are still in use. They terminate inside of the Star Tribune publishing house. Every once in a while you will see a train pull right into the building. I imagine there may be more than one track north of Plymouth, but I imagine we would have to contend with that freight train. So is it a trolley, or is it light rail? Because there is already a West Broadway streetcar in the planning stages. 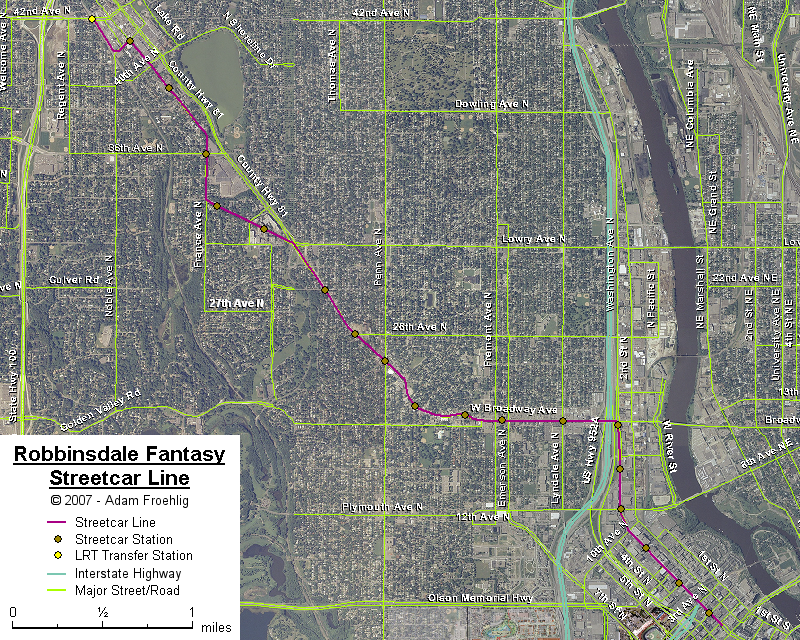 I like the idea of the street car connecting with the Bottineau Blvd route somewhere around RobbinsDale, if it stretched that far north, that’s in the study as an “extension” option. Echo Anne’s question about whether this is intended as LRT or Streetcar. If the latter, it should probably tie into the city’s proposed streetcar network at Washington and Hennepin instead of into Olson Hwy, though the description suggests the author is intending this as LRT. Regarding Wayne’s comment, this general corridor was looked at for the Bottineau line, but was discarded due to (real or perceived) impacts on street parking, right-of-way, and adjacent property owners. Several segments of West Broadway only have a 75ft right-of-way width (sidewalk edge to sidewalk edge). We know from past Riverview corridor discussions on Streets.MN that it’s a pretty tight fit getting LRT into an 80ft street corridor, let alone 75ft. Fitting a streetcar (which are generally narrower than LRT vehicles) MIGHT fit, and here’s one way it might work, but you’d be giving something up at streetcar stations and intersections, whether it be a left turn lane (needed at major intersections, especially closer to I-94), the “wide sidewalks” the author desires, or the bike lanes. UrbanDoofus brings up a good point: the existing tracks are still in use. And FTA/FRA frown upon dual freight/transit usage of rail tracks. Furthermore, there is a chokepoint on the rail right-of-way just north of 17th Ave N, with a 30ft width. Wouldn’t be a big deal if this line is built as part of area redevelopment, but it’s an issue at present with the author’s idea. Oh yes, the dreaded “parking concerns” that always ensures we will forever live in an auto-dependent wasteland. As I mentioned earlier, there are urbanist-desired things that would be left out of a surface-running rail line before one even gets to consider on-street parking. As for the question for how much of the corridor is narrow, pretty much the entire way from 29th Ave N to Girard Ave N is 75ft, with a few blocks in there even narrower at 73ft. East of Girard is where it widens to an 80ft cross-section (wider at I-94 and north of 29th Ave). Question, though. How much of the ROW is that narrow? Is it a small enough portion that a tunnel would be (economically) feasible? Everyone seems to be terrified of tunneling here unless it’s in a park or airport. Not sure about the elevated tracks. It seems everywhere I’ve seen elevated tracks the area under and nearby are intolerable shadowy litter strewn dead zones. My read on his proposal are that the “elevated tracks” are only for about a block, from 2nd and Broadway up to the tracks at the equivalent of 1st St.
I’m not sure why the CP tracks would be preferable to Washington Ave N between Broadway and 10th. Washington there is way overcapacity, leading to a major speeding problem. Light rail in the right-of-way (ROW) would likely calm traffic and allow for the continued possibility of freight by rail, which is easier on road wear and also better for residents. Washington also has lots of vacant lots left over from I-94 construction that could be developed. Otherwise good ideas. I agree that LRT on West Broadway is feasible if you are willing to consider short sections of tunnel and some ROW widening in the segment east of Girard that’s 25% parking lot (https://gettingaroundmpls.wordpress.com/2012/02/15/bottineau-no-for-north-part-iii/). Don’t know if this is your intent or not but how about having SWLRT bypass the Kenilworth Corridor and connect down Penn or far West Broadway and then continue on your suggested route into downtown and on to the current Green Line tracks in to St. Paul?